Welcome to Eileen's Favorite Craft Crafts and Other Fun Things. An everchanging site for crafts, fun and education. Here are a few of my projects and links to world wide web links. I am constantly seeing new web sites and kits for making soap. So I will be moving some of my links to this page to make it easier to find. I have not made and soap yet but hope to soon. Chanukah Table Candles but technique can be used for any holiday or event. You use cookie cutters to cut sheets of beeswas that is layered into a decorative table candle. Eileen's Crystal Wax Candles in Baby Food Jars. Great for everyone or to use in white for Shabbat. 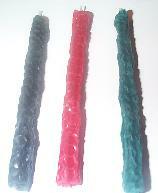 Wax Cut Outs on Candles. I am trying to find the time to "play" with candle paint! I bought some from Genwax but have not had the chance to work with it. Buy ready made Shabbat candles and paint a pair as a special treat for yourself or for a gift. Themes could be anything but for Jewish candles how about special ones for Yom Tovs (Holidays). Matzah designs for Passover, Apples for Rosh Hashanah, Shofars for Yom Kippur etc. This craft could be used for any age you can trust with paint (or cover the kids up well). They would need a pair of candle holders or something to hold the candles while drying and possibly while painting. Wax cut outs on candles:>HR>I have seen at Genwax and other places wax cut outs you can apply to candles either hand made or bought. Also want to use cookie cutters to cut sheets of beeswax and apply to other candles. If you have time try these.. I will get to them eventually. All of the rolled beeswax projects are based on a class I taught at an outside community event. Prestamped Rosh Hashana Cards for children to decorate with the wonderful new Gel Pens. (Which even grown ups could not resist.) See my Jewish resource page for rubber stamp sources. I decided to use sheets of beeswax. Could be taught inside or out and no MESS! I designed the rolled havdallah and braided candles to teach at a community event. Black and Jewish Culture Day at the Muscarelle Art Musuem of the College of Willam & Mary. Williamsburg, Virginia. It was a wonderful day! It was to go along with the special traveling exhibit of "Bridges and Boundaries Revisited African Americans and American Jews". Watch for this exhibit as it travels the country. It was very emotionally moving to see. The candles continued in a small way the theme of the exhibit, the similiarities in the past of the Jews and Blacks struggles etc. 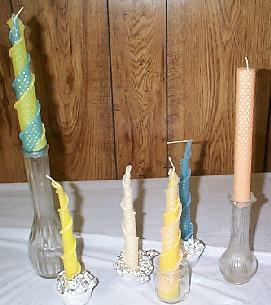 The Jews using these candles on Saturday night (Havdallah), braided them like they do their shabbath challah bread. The Blacks having braided their hair and children's hair for centuries. The Black participants shared some interesting braiding techniques for the candles that I wish I had pictures of! I discovered Paraffin wax sheets a few years ago. Genwax.com See my supply pages. I used them for a class I was co-teaching with Jill W..
Budget and ease were two concerns for this class of adults we were teaching at a JCC Women's Day. We wanted to have the class make three candles using two methods. Both braided and rolled. They were a hit. Although some ladies were sensitive to their smell. Beeswax comes in more colors. Paraffin cuts better when using a cookie cutter. Beeswax is more environmentally friendly. So it is up to you and your budget. Buying in bulk online makes both kinds of candles more affortable then single sheets bought in stores. There are other waxes on the market for crafting. Some being "natural" that might interest some of you. Plus other waxes for uses possibly other than candle making. Available at Genwax and other sites. 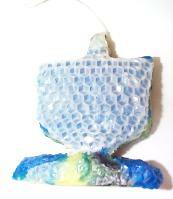 Plus wax comes in lots of forms: blocks, chunks, pearls, hurricane (paraffin) wax. Many of the sites have links to candle making and soap making. Genwax.com Candlemaking supplies has great lessons for beginners as well as advance candle makers. Has full directions and some interesting recipes. About.com Everything you ever wanted to know about candles. Basic directions and fun projects. Includes supply sources for all types of candles including the new: Magic crystals, gel, beeswax and more. Also About.com's Soap Page. Has a huge list of soap making and soap fun facts, games and recipes. Craftbits.com Australian Craft Company sells international. Also has lots of free project sheets and lessons including candle making and soap. Homeschoolzone.com's Candlemaking. This huge site has some real nice ideas for candles for everyday and holidays. It also has recipes for soap. Many use Lye and fat. I personally avoid these but many people make soap for their own use and not to teach children so the safety issues are different. Luminacandles.com Has supplies and some great candle making projects. Including some unusual ones. Has great safety tips. It has a great link page with a huge list of resource links for candles. Check out the directions for Non-Rolled Beeswax Candles from Honeycomb sheets! Really looks like fun. You use cookie cutters and layers of sheets of wax! Online store that also has free lessons for candle making and soap making. They sell soap making supplies and have lessons. The putty looks like a great product for making flexible molds for soaps, polymer clay etc. Check out the great video from the Soap Queen on how to use it. Sweetcakes.com Soapmaking supplies and fragrant oils. It also has LIP BALM SUPPLIES! How cool is that? Alphabet Soap Soapcrafting made easy is the way they describe their site. Looks good. Recipes, directions, and supply sources. The Book- "Soap Recipes by Elaine White" Has an online site for Soap making recipes and directions. By Elaine White. She has some great recipes for soap. She also sells a couple of books with recipes. One says 360 Formulas and Recipes for Art and Crafts using HONEY and BEESWAX! She also has some great link pages. Australian Craft Company sells international. Has unique kits including therapy crafts. Also has a long list of free craft projects. is a great source for craft, party, sports and school supplies. They sell some beeswax sheet kits.